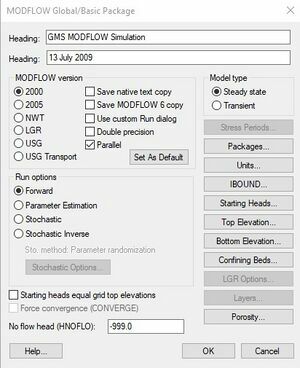 Starting at GMS version 8.0, GMS supports MODFLOW 2005. Choosing to use MODFLOW-2000 or MODFLOW-2005 is done in the MODFLOW Global/Basic Package dialog. Switch from one to the other at any time. The following list shows changes in MODFLOW-2005 from MODFLOW-2000. MODFLOW-2005 no longer supports the SOR1 Solver. MODFLOW-2005 replaces the DAMP variable with DAMPPCG and DAMPPCGT variables . These two new variables allow different damping factors to be applied separately to steady-state and transient stress periods. MODFLOW-2005 added support for the Unsaturated Zone Flow (UZF) package. MODFLOW-2005 provides more options for the LPF Package. Pictures below show the LPF package options supported in MODFLOW-2000 vs MODFLOW-2005. PES is not available in MODFLOW 2005. Automated calibration in GMS is handled using PEST. Below are tables of some of the available input and output files for MODFLOW 2005. Note: MODFLOW will produce the LMT and HFF files even if transport is turned off. For more information on these files see the manual. This page was last edited on 12 October 2017, at 22:43.